A big Green Phone Booth welcome to our newest eco hero, Kellie from Greenhab: The Browns Go Green, also known as The Greenhabilitator. You can read about her caped (hand made of course!) adventures here every Saturday. Please join me in welcoming Kellie! At home, her children call her a green momster, but when she steps into the phone booth, this mom of three becomes.....the Greenhabilitator! 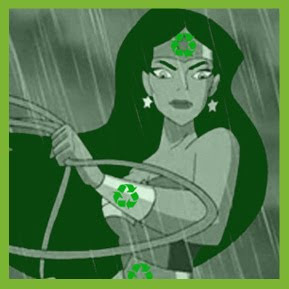 On a never-ending quest to diminish her footprint, the Greenhabilitator looks at everything that passes through her hands and asks one question: "How can this be done in a more eco-friendly way?" Wielding a sewing machine and a sharp tongue, the Greenhabilitator fights back against consumerism and planned obsolescence. She holds the power to whip up hand made gifts at a moment's notice and pack waste-free lunches every day of the year. Follow along as the Grenhabilitator works to brings back a simpler way of life for herself and her family. Welcome, Kellie! So excited to squeeze you into the Booth! It's great to meet you. I'm looking forward to sewing some of your sewing ideas! Welcome! Planned obsolescence drives me crazy, too.